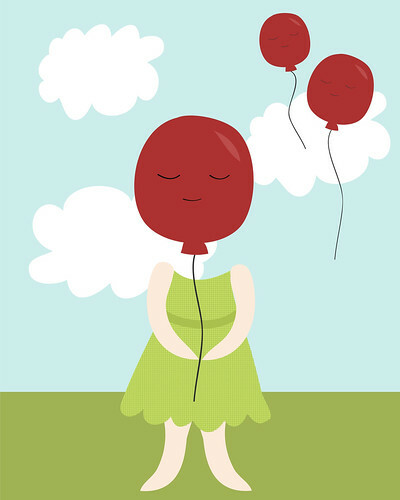 we all float – Hi, I'm Caroline. I’m excited, because last night I won a lot of 5 old alarm clocks on eBay. They’re perfect as parts/props for a photo shoot I have in mind. Yes, that’s right, photography! Remember, that thing I used to do occasionally? Before I got sidetracked by birthdays and contests and Boston? I’d nearly forgotten, myself. But now I have a few local folks who’ve volunteered their time as models, and I’d better take advantage of their generosity before the semester gets too crazy. In the meantime, I’ve been doodling. I spent the evening working on this little girl, whose head is threatening to drift off into the clouds to join her floating friends. Not that I’d know anything about having one’s head in the clouds, of course! My son would be so fascinated by this illustration. He’s 6 and still a balloon freak. I love old clocks! Lucky you!